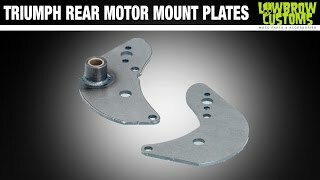 The highest quality reproduction engine mount plates available, these Triumph motor mount plates are for 1963 - 1970 unit Triumph frames. Featuring a beautifully TIG welded pivot with an oil-impregnated bushing pressed in place for your stock brake pedal (not included). The Lowbrow Customs motor mount plates are the only ones available with this bushing, giving you years and years of smooth brake pedal operation. This is the stock style engine plates for use on a swingarm frame, though these also fit on a hardtailed unit Triumph frame. Triumph engines had the same motor mounts from '63 on up, so these will also work to put your 70's 650 c.c. or 750 c.c. engine into a 1963 - '70 frame. The only thing to watch for is the later 70's Triumphs when they switched to left hand shift, because the brake pivot will be on the wrong side. Sold per pair. Made in the USA. I like this stand because the engine sits lower to the work bench. The cute of gravity is low and makes the whole engine more stable and easier to turn and manipulate.